Eye surgery is used to treat eye defects which cannot fully be treated by wearing glasses or contact lenses. For most eye defects, the only method of attaining an effective and long lasting cure is through eye surgery. The common form of eye surgery is laser surgery, which also comes in many forms. This helps to treat eye problems in a fast and efficient manner. Laser eye surgery has little risk or side effects; the chief problem though is that it is irreversible. What is Laser Eye Surgery Presbyopia? To understand this, it is pertinent to first understand what presbyopia is. Obtained from the Greek word presbys, which means ‘old person’ or ‘elder eyes;’ this is a condition of the eye that comes with aging. It is a situation where the ability of the eye to focus diminishes over time. This is a condition that usually affects people who are 40 and older. Generally, the use of laser eye surgery in curing presbyopia is not recommended nor advised and ophthalmologists used to be reluctant to perform such an operation, preferring instead to recommend bifocals to treat this condition. However, even though laser surgery cannot completely cure presbyopia, there are ways that laser eye surgery presbyopia can be performed to bring relief to the patient. This procedure is performed in such a way that is produces what is known as mono-vision during LASIK or LASEK. Presbyopia is a condition which affects a patient’s ability to focus on objects that are at a far distance and also those that are very near. What mono-vision does is focuses on treating each eye for a specific defect. Therefore a patient with presbyopia who is scheduled for a mono-vision LASIK for instance would have one eye reshaped to enable focus on distant objects while the second eye will be reshaped for near object focus. This procedure is not suitable for all patients and ophthalmologists are usually careful before prescribing laser eye surgery presbyopia for their patients. A patient would usually be tested using mono-vision contact lenses first before any surgery is done. This is important because laser eye surgery is irreversible. 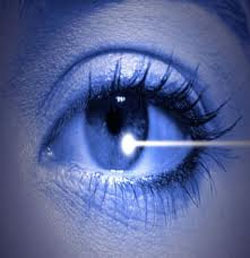 The procedure for this type of laser eye surgery is the same as in any other type of laser eye surgery. Tests are conducted to ensure that the patient is suited for laser eye surgery and this would include corneal tests. Once it is decided that the surgery would be done, the eyes are cleansed and prepared for surgery. During the operation the eyelids are held open and eyelashes draped so they do not interfere with the operation in progress. Laser surgery is pretty quick and could be over in as little as 15 minutes. It is usually done as an outpatient procedure and the patient is released to go home that very day. Total recovery takes about a month and in that time, the instructions of the surgeon should be followed to the letter. The cost of laser eye surgery for presbyopia in the UK is about £1500 for both eyes. However, this is a conservative estimate as it could be more than that depending on the skill and reputation of the surgeon.